ESN KTU — what is it? ESN (Erasmus Student Network) is a student organization that unites creative and active students to one big and friendly family who cares about supporting and developing student exchange. We are the ESN section of Kaunas University of Technology. The goal of ESN KTU is not only to organise various events for foreign students (Erasmus+, other exachange programmes and full time degree international students) but also to help them to merge into the Lithuanian culture. ESN is a non-profit organisation, and as every ESN KTU member would say: "The money from all over the world could not provide so many joyous moments and experience as being a member of the ESN KTU." 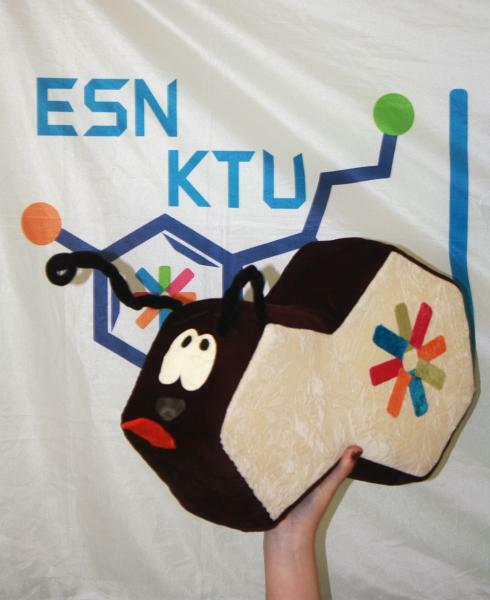 ESN KTU logo is composed of the molecule of serotonin, also known as the hormone of happiness. As one of the biggest technical universities in the Baltic States, KTU assures high quality studies for exchange and degree students. Whereas we, the ESN team, do our best to make the students happy during their leisure time. As a result, ESN KTU makes the perfect combination between the studies and a great time! ESN KTU – the pursuit of happiness. Our mascot is named Gapsas and he is our logo in physical (and plush) form. ESN KTU takes him to all the trips and events, so he could be considered the most active member of the team. Become friends with him on facebook here! Being a member of the ESN KTU enables you to find many friends not only from Lithuania but also from the most exotic countries. It is a perfect possibility to get to know other cultures, traditions, compare cuisines of different countries and to spend your free time in productive, creative and fun way. ESN KTU is a great place to get experience of organising events, improve presentation skills, participate in national and international trainings, get valuable volunteering experience, improve languages and professional skills, and many other great opportunities. Peer mentor is a student who has a direct contact with foreign students. Peer mentor is the first Lithuanian friend of the foreign student who meets them at the station or the airport with a toothy smile and a good mood and helps settle in their new home named Kaunas. If you have been abroad, you know how helpful having a peer mentor is. However, mentorship is not just the care for foreign students, it is a good opportunity to develop your English skills, meet new friends, participate in events organised by ESN KTU and share a good time with foreign students. ESN KTU member (ESNer) – a student who has a wider knowledge about the organisation affairs, participates in ESN KTU meetings, suggests the craziest ideas for new events or projects and make them a reality. Also, an ESN KTU member collaborates with other sections of ESN in Lithuania and other countries, participates in national and international seminars, trainings and events. If your goal is that Lithuania would be associated with more than just beautiful girls, national food–cepelinai and basketball, YOUR heart is already beating in the ESN beat. Both Lithuanian and foreign students are welcome to join us!